"SystemError: The type initializer for 'Emgu.CV.CvInvoke' threw an exception." I was able to work around this by passing in the ".rect" rectangle attribute to the Draw method (I'm guessing the api has evolved since the 1.4 Emgu version used for the original). 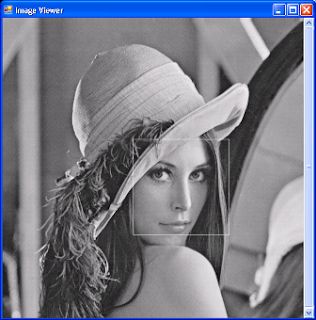 Lastly, I was getting two objects detected--so I used parameters to the detector to only get the single face in the image (basically by telling it to use a larger minimum detection size, minSearchScale). Anyway, now it works the way I was hoping. And lastly, I'd be remiss if I didn't include lovely Lena, with face detected (in B&W, sorry about that Lena). Hi.. i have made a piece of code which uses haar classifiers to detect human face and track it using camshift algorithim.. i have used EmguCV.. It's 2012, and this still works. I had to change for my install paths, and the img.HaarCascadeDetect throws a deprecation warning. I also didn't have to link OpenCV in my system path. Thanks a bunch! To clarify, I'm using the newest release of everything (IronPython 2.7.2.1, Emgu 2.3.0, OpenCV 2.3.1). Thanks again!